Your Wedding Breakfast is a hugely important part of your wedding day, for many of our couples food is one of the great joys in life! There’s nothing finer than sharing a relaxed meal with friends and loved ones, especially when the wine is flowing and someone else is doing the cooking. One of the best things about having your wedding at a Best Day Ever Venue is that you’re not restricted to someone else’s idea of what your Wedding Breakfast meal should be, we don’t do set menus because we understand how personal food is. We want you to be able to choose something that really reflects you as a couple, your theme, your day and the season you’re getting married in. Have you spent every holiday together taking gastronomic tours of Italy? If so, you might love the simplicity of Italian food; the general ethos is to use only the very best ingredients and to do as little as possible to them. They're passionate about bread, the Italian’s don’t do boring bread; if you want rustic, crunchy, freshly baked and seasoned, focaccia, ciabatta, etc. you can have it! Who are you? How did you get together? Do you share a passion? What is your wedding theme? Let your Wedding Breakfast say something about you as a couple, some of the most amazing menus we've seen help to tell the couple’s story. Whether it’s a cultural reference, for example the Groom is Scottish and you’ve just got to have some Haggis, Tatties and Neeps somewhere in the meal; or maybe you’re getting married at Halloween and want a spooky pudding! The possibilities are endless. There’s absolutely nothing wrong with indulging your sense of humour when it comes to food. A ‘host-a-roast’ is food theatre at its best with surprisingly comic effects. Rather than letting the chef carve your gorgeous roast beef or leg of lamb in the kitchen, each table is presented with a whole roast and one unsuspecting guest has been nominated as carver. The element of fun comes in when the cheeky Bride and Groom have supplied the carver with a rather compromising comedy apron! It’s a real ice breaker and really gets everyone involved and laughing. Do You Want It To Be Memorable? Maybe you want to do something that will really make your Wedding Breakfast truly memorable, adding a ‘surprise’ course is often all it takes; a ‘shot’ of insanely tasty soup or maybe an amuse bouche to begin. Something that always amazes and delights guests is when couples opt for a trio of exquisite desserts, they are visually stunning and guests just love that they got to try three different puds! 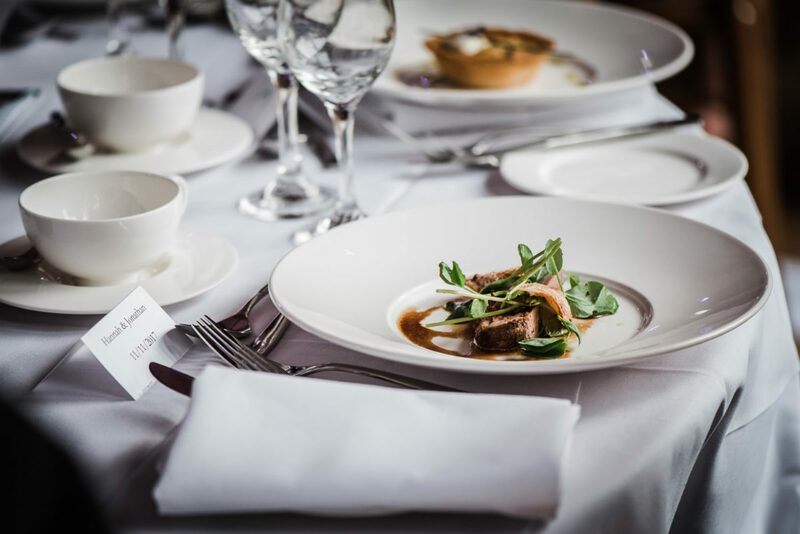 It’s always best to have thought about all these things prior to your individual meeting with our catering partners but don’t get too fixated on an idea before you’ve talked things through in detail with them. This is because your idea might need a bit of revising and tweaking to make it possible for the chef to produce one hundred of them, perfectly, on your wedding day. Sometimes, the dishes we come up with at home just don’t work on a large scale and it’s wise to take advice from the very experienced catering team who know their chefs, know the kitchen and know what can be delivered perfectly; work together to come up with choices you love, then encourage, empower, and inspire the caterers to do it better than they’ve ever done it before!